Andrew Jackson's family moved from Ireland in the 1760's. His father was killed shortly before Andrew was born, so his widowed mother raised Andrew and his two older brothers in the home of a relative. 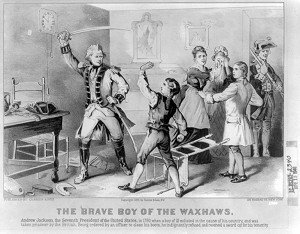 When he was thirteen years old he joined the Continental Army as a courier. * He and his brother were captured by the British. Once when he refused to polish the shoes of a British officer, the officer hit him with a sword and left scars that would remain the rest of his life. There were inward unseen scars also as a result of the war because he lost his older brother, and his mother also died during the war as a result of cholera. When he was fifteen years old he received an inheritance from his grandfather in Ireland, but being young and inexperienced he was unable to handle the windfall and spent the entire amount in a week's time. He studied law and became a lawyer at the age of 20. He headed west to Tennessee to seek his fortune. His destination was Nashville and there he met Rachel Robards, a young woman who had married at age seventeen and was estranged from her husband. She thought her husband had obtained a divorce and she and Andrew ran away to Natchez, Mississippi and married. Unfortunately, she was mistaken about the finality of the divorce. They returned home after six months only to find out they were not legally married. Her husband then sued for divorce on the grounds of adultery, the first such case in the state. When the divorce was final she and Jackson were married a second time, this time legally. In 1796 he served in Congress as a State Representative from the state of Tennessee. In 1805 there was a dispute over a bet on a horse he had with a Mr. Erwin. 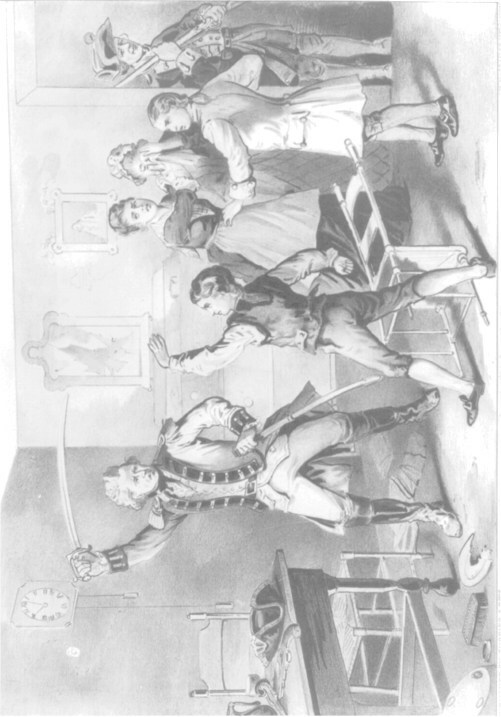 A duel ensued between Jackson and Mr. Erwin's son-in-law Charles Dickinson. It was agreed that Dickinson would shoot his pistol first. His shot hit Jackson and wounded him, but he didn't die. Jackson's first attempt to fire failed, and he took dead aim again and fired a fatal shot at Dickinson. The man survived for a few hours, but subsequently* died. The bullet would remain in Jackson the rest of his life and cause him a lot of pain and trouble. In 1812 the United States declared war on Great Britain. Andrew Jackson was the commander of the Tennessee militia. Their mission was to defeat the Creek Indian warriors who had sided with the British. At one point Jackson's soldiers threatened to mutiny. * He said he would kill them if they left. Previous threats had been carried out, so the mutiny did not occur. In March 1814 he cornered the Creek Indians in Alabama. Not one of the 1,000 Creek Indians surrendered, but all were killed in the Battle of Horseshoe Bend. The Tallapoosa River ran red with the blood of those who had been slaughtered. Sam Houston who fought alongside Jackson agonized over the events that took place that day. 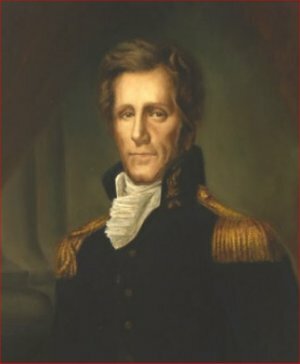 Andrew Jackson was known as "Old Hickory". He was as tough as a hickory stick and had an unbending will. Yet there was a soft side to him also. On a march he preferred to walk with the troops and let the wounded soldiers ride on the horses. The British were threatening New Orleans. It was here that the last major battle of the War of 1812 would take place. Jackson teamed up with the French privateer and pirate, Jean Lafitte and the free blacks of New Orleans. He had about 4,500 men and was outnumbered three-to-one by the British. The British thought it was going to be easy to defeat the American troops there, but they were surprised when Jackson and his troops stood their ground. The British would lose hundreds of men, but Jackson only had 8 soldiers killed and 13 wounded. After 1815 the British left the Americans alone. Jackson, now a celebrity, went back home to Tennessee and his wife Rachel. They never had children of their own, but adopted one of Rachel's nephews and named him Andrew Jackson Jr. He adopted a young Creek Indian child, Lyncoya, after his parents had been killed by Jackson's troops. He died at the age of 17 the same year Rachel died. They also raised other nephews. Rachel's life was different than she had imagined it would be when she married him. She did not anticipate having to spend so much time by herself. She once said her husband spent "less than one-fourth of his time under his own roof ". Andrew Jackson became a wealthy man. He owned a lot of land he called The Hermitage. * He grew cotton which was worked by over a hundred black slaves. Jackson was the master and cotton, rice, and tobacco fueled the economy at the time. More land was needed to grow more cotton. This had devastating consequences for the Indians who lived on the land, as we shall see later on. Florida was owned by Spain. In 1817 Jackson invaded Florida in pursuit of Indians. He had been instructed by President Monroe not to do so, but he did it anyway. Two British officers were killed. Henry Clay called on Congress to censure Jackson, but they refused. In 1824 Jackson aspired to the presidency of the United States, but John Quincy Adams also wanted to become president. In those years the electoral college chose the president. In the election of 1824 Andrew Jackson had more popular and electoral votes than Adams, but the election was thrown into the the House of Representatives and John Quincy Adams was elected. Four years later Jackson again ran against John Quincy Adams and used the press and vigorous campaigning to win the popular vote. They organized rallies to stir up the popular vote revolutionizing the election process. But it was a hollow victory for Andrew. 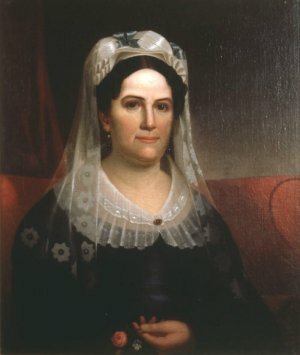 His beloved Rachel died of a heart attack in December of 1828 before Jackson was inaugurated in March of 1829. In his mind John Quincy Adams and Henry Clay had been responsible for her death. Rachel's niece Emily would serve as hostess in the White House. The Jacksonian Era had begun. Farmers and tradesmen came to Washington to celebrate his inauguration in 1829. They were a rowdy group and Washington insiders were aghast. * They called it a "riot". His enemies feared Jackson would become "King of America". His motto seemed to be To the victor belong the spoils, and he certainly employed the "spoils system". One of his first acts was to fire dozens of federal employees, some who had been there since the days of George Washington. In their place he appointed people who had supported him. One such appointment of John Eaton as Secretary of War rocked his administration when Eaton became involved in an affair with Peggy O'Neal Timberlake. The effects of the Eaton Affair were so far-reaching that the vice-president and all Jackson's cabinet resigned before it was over. John Calhoun, Jackson's vice-president favored slavery and asserted that states could disregard federal law if they deemed the law unconstitutional. He called the theory nullification* , the exercising of state's rights. They tried to get Jackson's support. The Nullifiers at a dinner in 1830 sought his support, but in his words, "Our federal union! It must be preserved!". He would not tear apart the nation. South Carolina threatened to leave the nation and start a civil war. Henry Clay got a compromise bill that would avert the tariff they opposed. In 1835 New York Abolitionists* started sending pamphlets urging an end to slavery, but a lot of the mail was burned. Even though it was against the law to tamper with the mail, Jackson encouraged postmasters to destroy the mail his opponents were attempting to send. Jackson in order to further the expansion of the frontier west supported the Indian Removal Act in 1830. The Cherokee Indians liked to live a harmonious way of life, and many of them embraced the white man's way according to Jefferson's advice to them, but they still had to move. The Supreme Court ruled in the Cherokee's favor, but Jackson said to ignore it. Ironically these same people had fought with Jackson. The removal of the Cherokees, known as The Trail of Tears is a low point in American history. In Georgia they had to leave houses and could only take the clothes on their backs. More than 2,000 of them died on the trail. They referred to the president as "Jackson the Devil". There was a central bank called The Bank of the United States. Jackson didn't trust the bank and during his second term as president he vetoed a bill to renew the bank's charter, took all the money out of the bank and parceled it out to state banks run by his friends. 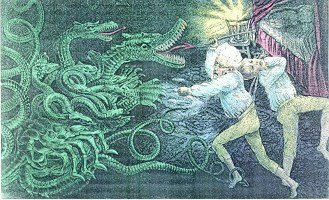 This cartoon shows Jackson fighting the "monster bank". In 1832 Jackson and Martin Van Buren founded the Democratic Party. The cartoonists had been portraying Andrew Jackson as a "Jackass" in derision. The donkey ultimately became the symbol of the Democratic Party. Thomas Nast, a Republican and famous political cartoonist is generally credited with first designating the political parties with the Democratic donkey and Republican elephant. In 1835 there was an assassination attempt on Jackson's life. A deranged man, Richard Lawrence, fired two shots at him, but both failed to ignite. The man was declared insane and put in an institution. Martin Van Buren succeeded Andrew Jackson as president and Jackson returned to the Hermitage. Upon leaving office he said, "After eight years as president I have only two regrets. That I have not shot Henry Clay or hanged John C. Calhoun." as in He won by a landslide. the enforcement within its territory of a federal law of the U.S.
At biography.com search for Andrew Jackson. Press "Go" to search for books about Andrew Jackson. This page displayed 143,812 times.